Six host venues were unveiled today for the official start and finish lines of the 2011 Larry H. Miller Tour of Utah professional cycling event. The six-day stage race is scheduled for August 9-14 and has been recently elevated to one of the top three pro cycling events of its kind for North America. Event organizers also confirmed four of the top international teams have been extended invitations to compete, a first for the annual event. The 7th edition of the Tour of Utah will consist of an opening prologue and five stages. It promises to uphold its moniker of "America's Toughest Stage Race" as the overall route plans to incorporate some of the country's most stunning scenery and epic climbs along the Wasatch Front in central and northern Utah. A new opening Prologue will be hosted by Park City on Tuesday, August 9. The week will conclude with its signature "Queen Stage" at the Snowbird Ski and Summer Resort on Sunday, August 14. - Sunday, August 14 - Park City to Snowbird Ski - Stage 5, Road Race & Summer Resort "We appreciate all the support of the State of Utah, Salt Lake County, civic communities, corporations and the loyal fans who truly appreciate such a well-established and esteemed sporting event. It really is more than just a bicycle race now. All of us with the Tour of Utah applaud the continued support to grow this event, which is now in the spotlight as an international event," said Steve Miller, president of the Utah Cycling Partnership which owns the Tour of Utah. He was joined on the steps of the Rotunda in the Utah State Capitol for the public announcement today by Utah Governor Gary R. Herbert, USA Cycling CEO Steve Johnson and America's all-time winning pro cyclist Davis Phinney. The Larry H. Miller Tour of Utah began as the Thanksgiving Point Stage Race & Cycling Festival as a three-day event over Memorial Day weekend in 2004. The Utah Cycling Partnership, owned by family members from the Larry H. Miller Group of Companies, purchased the event in 2007 and re-launched the cycling event in 2008 as a five-day race. The race had grown from 9,000 feet of climbing in the first years to nearly 30,000 feet of climbing, becoming known as America's Toughest Stage Race. The Tour of Utah is now sanctioned by both USA Cycling, Inc. and the UCI. In 2011, Miller Motorsports Park will host the Individual Time Trial for the fourth consecutive year. Ogden, Salt Lake City and Snowbird Ski & Summer Resort will also host stages for the fourth year in a row. Like last year, Park City will host two stages, but for the first time will host the opening Prologue, a short preliminary time trial to establish the race leader. While the race has passed through Provo in past years, it is the first time in four years that the city will be an official host city. In January, it was affirmed that the Larry H. Miller Tour of Utah had been elevated by the Union Cycliste Internationale (UCI), the worldwide governing body of cycling, to a 2.1-rated event for the UCI America Tour. Of the 30 sanctioned races on this tour (North and South America) in 2011, the Tour of Utah joins the Quiznos Pro Challenge in Colorado and the Amgen Tour of California as the only top-rated stage races in North America. This provides an international spotlight for Utah and for all host cities, as the event will entertain top teams and athletes from across the globe. A total of 15 domestic and international professional cycling teams will be invited to participate and organizers have increased prize money from $45,000 to $116,000. "It was a great week in Utah last year. The whole week was hard, a hard course every day. I really appreciate a race like the Tour of Utah, which keeps getting bigger and better. From all the volunteers in the local communities, to the sponsors, and to all the fans who come to each stage, I look forward to defending my title with Team RadioShack this year," said Leipheimer, the 2010 champion of the Larry H Miller Tour of Utah. He raced last year as an individual with Mellow Johnny's. In July 2010 Leipheimer finished 13th overall at the Tour de France. "The 2011 Tour of Utah is a must-see race for U.S. fans, where you'll find the best cycling athletes in the world competing across one of the most scenic regions in the world." The Larry H. Miller Tour of Utah continues to be free to all spectators, making professional cycling one of the most unique pro sports in the world today. More than 350 volunteers are needed for the event and cycling fans are encouraged to volunteer for one or more days of the event. 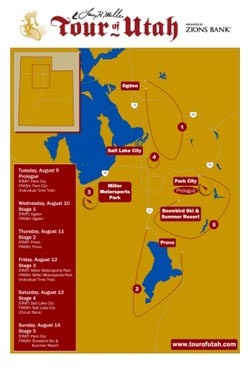 Official information will be posted at www.tourofutah.com, with updates on Facebook, Twitter, and YouTube. Deemed "America's Toughest Stage Race," the Larry H. Miller Tour of Utah presented by Zions Bank, is a six-day, six-stage, professional bicycle road race along the Rocky Mountain's Wasatch Range. It traditionally covers more than 400 total miles of racing through some of Utah's most beautiful and challenging terrain. Now in its 7th year, the 2011 Tour of Utah is scheduled to take place August 9-14 as a UCI 2.1 sanctioned road race for the best pro cyclists in the world. The event is owned and operated by the Utah Cycling Partnership. The 2011 Tour of Utah will be accompanied by a colorful, rolling festival celebration that will take place at each day's finish line host venue. More information can be found by visiting www.tourofutah.com. Medalist Sports, LLC is an international, full-service, sports management and production company. An industry leader, Medalist Sports specializes in the successful planning, promotion and management of special events, ranging from professional competitions to amateur experiences, to cause-related/fundraising events. Members of the Medalist team are proud to have been involved with and helped manage such events and properties as Tour DuPont, Tour of China, Amgen Tour of California, Quiznos Pro Challenge, Tour de Georgia, Tour of Missouri, the Lance Armstrong Foundation (Livestrong Challenge), USA Cycling Professional Championships, the Tour of Hope, The Dempsey Challenge presented by Amgen and more. Medalist Sports' headquarters are located south of metro Atlanta at P.O. Box 415, Tyrone, GA 30290. The company website is www.medalistsports.com. Tour of Utah/Peloton Sports, Inc.